have the inhibitor gene. I think these nicknames can be very confusing to a person first learning about silver genetics. Here, I am going to explain the inhibitor gene the way my brain understands it. Other people may understand it differently. Most of the time when someone says a cat is "Silver", they are talking about a Shaded Silver or Chinchilla (a shell silver). These are not different breeds, they're colors/patterns. I personally refer to all cats with the inhibitor gene as Silvers. No offense to the Silver & Golden breeders. That's just how I keep in mind that all of the following patterned cats have the inhibitor gene. A cat only needs one copy of the gene from one parent to be a silver. To get a silver kitten, at least one parent has to be silver. unless bred to a silver mate. If a cat has 1 inhibitor gene, it is heterozygous for silver. always produce silver kittens, even when bred to a non-silver mate. 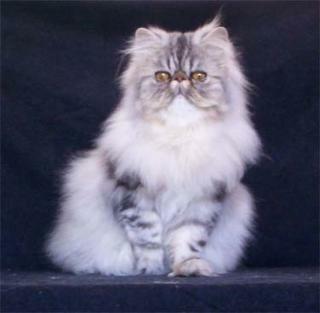 "Silvers & Goldens" have a separate division within the Persian breed. The Exotic breed is not divided into separate divisions at this time. This gives Silvers an exceptionally clear, bright silver color. The Goldens have a an apricot color, lighter than a brown tabby. very large round eyes and wide open expressions. Shaded Silvers have the inhibitor gene and wide band shading genes. They also have agouti genes. "shade out" the tabby pattern. 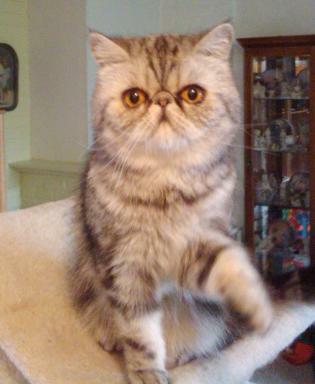 They are selectively bred for cats that do not have leg barring or tail rings. They have a silver undercoat and black or blue tips on the hair shaft. Chinchillas also have the inhibitor gene and wide band shading genes. Just the very tips are colored, like a shell. Goldens do not have the inhibitor gene. 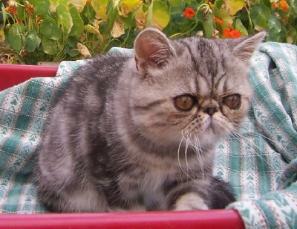 Shaded Silvers can be used in a silver tabby breeding program. Generally they'd be used to improve the silver color on the silver tabby. Another factor to consider is the eye color. 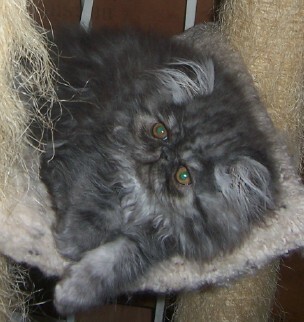 However, silver tabbies are allowed green, hazel, or copper eye color. black, inhibitor, agouti, wide band shading. and have green or blue-green eyes. 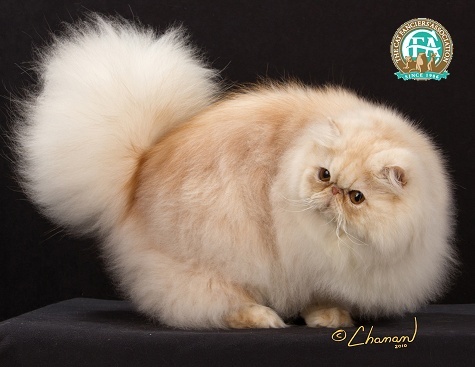 The color is accepted for Championship Status in both the Persian and Exotic breeds. and they have copper eyes. 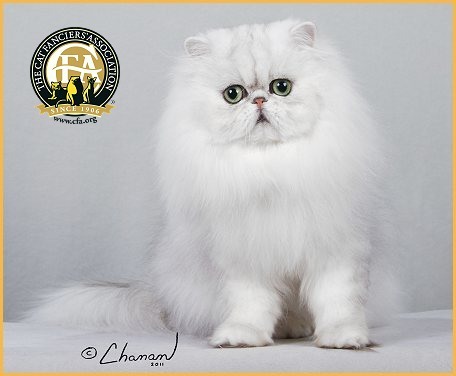 The color is accepted for Championship Status only in the Exotic breed. 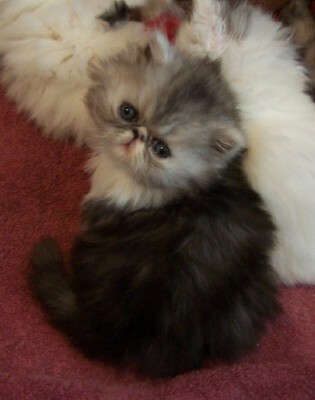 Smokes, Shadeds & Shells have their own division in the Persian breed. Exotics are not divided into separate divisions. All smokes, shadeds, and shells have the inhibitor gene. a shell has only the tips of the hair shaft colored. Exotics are allowed the colors shaded black and shell black. "Cameo" is a "nickname" used for reds with the inhibitor gene. like the cameo broaches women used to wear. Check the CFA website for updated Breed Standards. You can buy them for $5 or print them yourself from the web site. clear on the color and pattern descriptions. 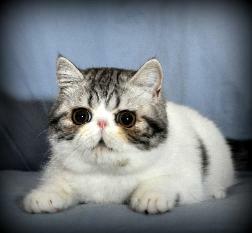 Silver tabbies are shown in the Tabby Division in the Persian breed. The Exotics are not divided into separate divisions. All silver tabbies have the inhibitor gene. red silver tabby (a.k.a. cameo tabby) & cream silver tabby. They may or may not have the agouti gene.